High up in Colorado's Rocky Mountains, the Marriott StreamSide – Douglas resort offers classic mountain accommodations in the perfect setting. Find timeshare resales and rentals priced up to 70% off retail today. Built in the heart of Vail, Colorado's ever-popular ski retreat, Marriott's StreamSide Douglas offers incredible accommodations close to all of the area's best attractions. Part of the larger StreamSide complex, the Douglas property incorporates a contemporary mountain-chic design with a variety of on-site amenities and services to create the perfect mountain escape. 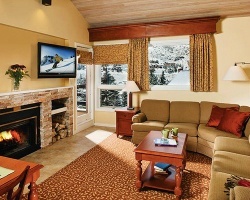 Enjoy free shuttles to local ski lifts, an indoor/outdoor connecting pool, and so much more with a StreamSide Douglas timeshare. The loft-style villa units at the StreamSide Douglas property are split between well-appointed one and two bedroom spaces filled with updated furnishings and tasteful features. 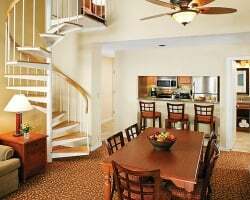 With towering spiral staircases in the center of each suite leading to the second level, you and your entire party will have enough space to move around as you see fit and still be comfortable. With homelike amenities like full kitchens, fireplaces, and your own balcony, it's hard to see why anyone would pass up an opportunity to own a private escape at the StreamSide Douglas. 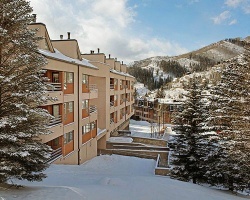 Are you ready to find your dream accommodations in Vail? Fill out the form on this page to learn more about ownership opportunities at the StreamSide resort, or call a representative at 1-877-815-4227. Buying a timeshare at Marriott's StreamSide – Douglas can result in years of memorable trips to the Rockies filled with exclusive owner benefits. However, if you buy that timeshare through the resale market, you have the opportunity to earn all of those benefits for much less than what others pay. Timeshare resales are often priced thousands of dollars less than what the resort itself offers, since resales are sold by individual owners. What results is the same amazing ownership options at the StreamSide Douglas for discounts of up to 70%, giving you a great chance to save. StreamSide Douglas resales are offered in the form of deeded fixed and floating Marriott timeshare weeks spread throughout the brand's Value, Special, Preferred, and Prime seasons. You'll have a number of different price points and unit sizes to choose from on the resale market, ensuring you find an ownership interval and vacation solution that works for you. 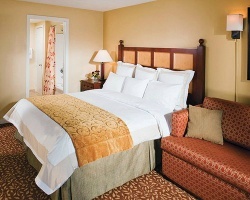 What's more, your resale could lead to further perks and privileges through the Marriott Vacation Club. The StreamSide Douglas resort is affiliated with the Marriott Vacation Club, one of the best vacation ownership clubs in the world. Resale owners at the StreamSide will have the opportunity to reap the rewards of some of the club's best benefits, allowing you to enhance your vacation experience as you see fit. You can convert your timeshare week to Marriott Vacation Club Destinations points to unlock a better vacation-planning experience through Marriott's popular points-based ownership system. You can also seek out other vacation opportunities through the Marriott Vacation Club by spending your points on trips to other Marriott resorts in destinations across the United States, the Caribbean, Europe, and more. This Marriott Vacation Club Vail property is also affiliated with Interval International, a popular timeshare exchange company. An Interval International membership can help you maximize the vacation potential of your resale, as it can enable you to explore other destinations across Interval's 2,000-plus resort network. Simply deposit your Vail accommodations into the exchange network and trade for stays at comparable resorts worldwide. What's more, the StreamSide is a Premier-rated resort, meaning you'll be able to exchange for stays at resorts of similar high-quality. This Vail Marriott StreamSide property employs a number of amazing on-site amenities and services to make your Vail vacation one to remember. Start at the connecting indoor/outdoor swimming pool for some water-based recreation, or take advantage of the resort's racquetball and basketball courts for some friendly competition. Soaking in the whirlpool hot tub is a thrill in the wintertime, while summertime visitors can explore one of the hiking or biking trails beyond the resort's grounds to take in the cool mountain breeze. Take the StreamSide's complimentary shuttle to area ski lifts like Lionshead or Vail, and stop at the on-site Charter Sports for equipment rentals and storage. Nearby attractions around the resort will leave you with plenty to do and see. Hiking and snowmobiling through the White River National Forest is a great way to get in touch with Colorado's inner beauty, while springtime festivals and events in downtown Vail are ideal for those chasing the specific culture of the region. The skiing doesn't stop at Vail, with nearby areas like Avon, Beaver Creek, and Breckenridge also offering magnificent slopes. Head into Denver for a day trip to taste the beer at famous local breweries or stop in at the Denver Museum of Nature and Science and the Downtown Aquarium. Already Own at Marriott's StreamSide Douglas?